It’s no secret that trampoline jumping is a fantastic form of exercise. With the fast-growing indoor trampoline centres, kids and adult alike are getting into the fitness craze. But how do you get the most out of your trampoline…? Kind of. Trampolines were historically used in astronaut training so they could experience the feel weightlessness (zero gravity). To put your trampoline to astronomical use, jump as high as you can to burn more calories. When you bounce back up from an extreme height your muscles are forced to react three times the force of gravity. And hey, you can always pretend you’re floating through space while you do it! 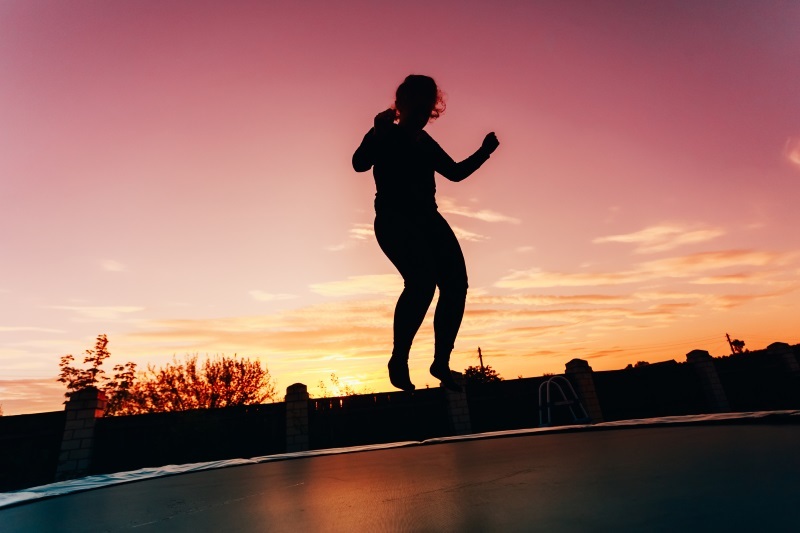 Star jumps are a terrific way of getting your heart rate up and the calories burning, so imagine pairing them with the bounce of a trampoline? Jump higher and higher and stretch longer and longer with your arms and legs to maximise the effects of the workout. Jump-jogging is exactly what it sounds like: jumping and jogging. Doing a jog in one position on a trampoline gives you the benefits of a light jog without the high impact stress of jogging on solid ground. You can start off with little steps and progress up to higher springs (lifting your knees) when you get into the rhythm of it. This is a great way to warm up before jumping into the rest of your workout (jumping, get it?). Simply bouncing on your trampoline can help tone your muscles as well as get your heart rate up. Nothing fancy, just simple vertical bouncing. Trampoline jumping is a wonderful way to get in shape whether you’re a kid or an adult. Get the most out of your Topline Trampoline with correct exercises to keep you fit and well. Topline Trampolines produce professional-grade trampolines; perfect for health and fitness. Give us a call or browse our website for all things trampolining.